Sky claimed today that their new 3D channel would not just bring an extra dimension to television, it will change how people watch TV. 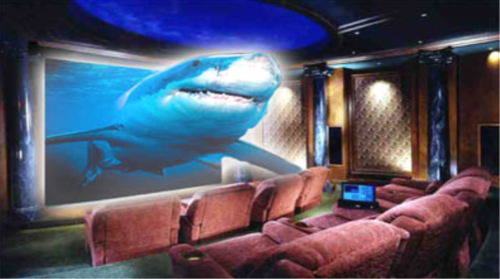 3D TV will be about big events – about sports matches, about concerts and big movies. While TV today is something on in the background, an experience people dip in and out of while chatting on the phone, texting or doing the ironing, 3D will change that because the more engaging experience will demand a lot more attention. You wouldn’t want to be doing the ironing while wearing 3D glasses would you? You’d probably catch yourself hurling the hot metal at an approaching virtual shark or something. Event TV is already a popular concept – live shows like the XFactor which get lots of people sitting in, watching TV at the same time. In an age of on-demand anytime content on the internet, the idea of everyone gathering round the set and getting an immersive live experience is gaining some traction. It’s what TV needs to make it special again now we’ve got many other screens in our lives. And 3D is what will make TV special again, and make it the centre of attention once more. The 3D channel will be available at no extra charge to Sky+HD customers with Sky’s top TV package, though you will need a 3D ready TV. Related: Can 3D TV make you feel a bit sick? Poll: Blackberry PlayBook – do you think the name is a bit racy? What were Nintendo selling in 1889? Clue: it wasn&apos;t a Wii…. It’s not just when doing the ironing etc. Inviting your mates around to watch the football but not having enough 3d glasses to go around. Then there’s always one mate with a dodgy eye who can’t watch it. Until they make Jaws 3D and advertise it on 3D billboards in 2015. I’m not interested.